Blyncsy is a growing startup in SLC, Utah that focuses on a big data approach to understanding movements in and around cities. Their proprietary sensor technology uses connected devices to create a broad strokes portrait of the habits and trends of large populations. Starting the Project: Who Are We? The first challenge is always thinking through the big questions: Who are we? What do we need to look like, how do we visualize our personality internally and externally? Who are we worried about connecting with visually? I started with founders' interviews to explore some ideas and get to know their goals. The personality of a company should in part reflect its founders, but it should also point where the company wants to go. With some Q&A, research into the market and competitors, and a few rounds of versions, we executed their logo in all the necessary versions, along with some supplemental branding on critical touchpoints, including the proprietary sensor unit and company apparel. 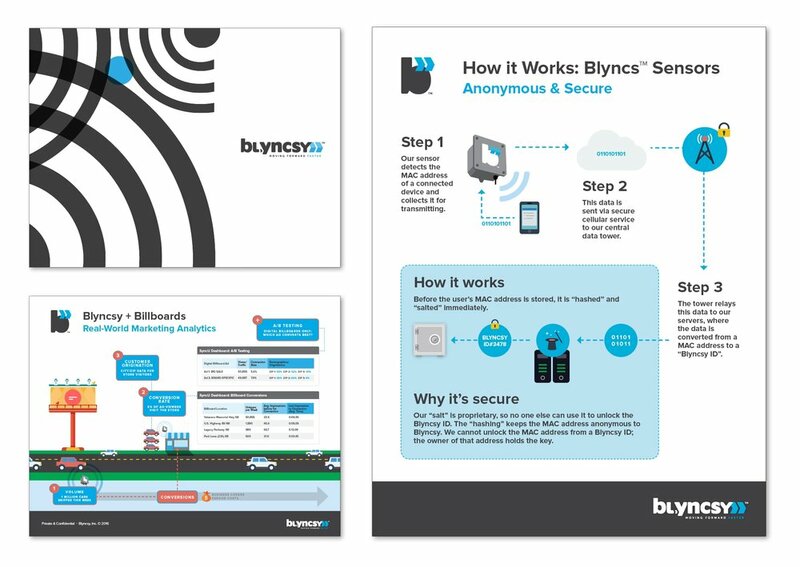 As Blyncsy grew and pitched projects, there was an intense need to explain their technology in clear, succinct terms. Data privacy concerns as well as product viability drove energetic, clean infographics for presentation decks. I spent a lot of time getting to know the product inside and out so that I could digest, simplify, and more clearly explain concepts, often assisting with content rewrites alongside the graphics. The Blyncsy client back-end needed a visual overhaul once the developers had created their powerful big data visualization tools. I worked closely with their data scientist to discuss the most user-friendly approaches for interpreting data, while also re-skinning the interface and creating hundreds of options for different styles of tables, charts and graphs with interactive functions. The goal here was to put the end user in a comfortable and familiar position for frequent use of similar tools, while making special features and options easy to spot and operate. Blyncsy launched their own Squarespace site before we started working together, and since then the process has been a slowly-evolving process of visual retooling and content updates—a work in progress. But we've done well to keep it from being a frankenstein. Indeed, even simple moves like the use of a consistent typeface across presentations and the web is a nice touch and anchors the brand in an elegant way. Strong, stark black and white imagery provide a canvas for Blyncsy's bright blues, while white space and elegant, modern type keep things bright and accessible. Why Squarespace? One of the advantages of Squarespace is that it's so simple to use. Blyncsy can edit their own site content whenever they like, but it's just as easy for me to hop on and tweak design elements, create press releases, or maintain the content if they would rather not spend the time on it. This makes for easier collaboration when that's called for, but moreover it allows someone with an eye for branding to control the organization, copywriting voice and design details simultaneously, without the need for any time-consuming, expensive coding. Edits are immediately live with no downtime for the site. 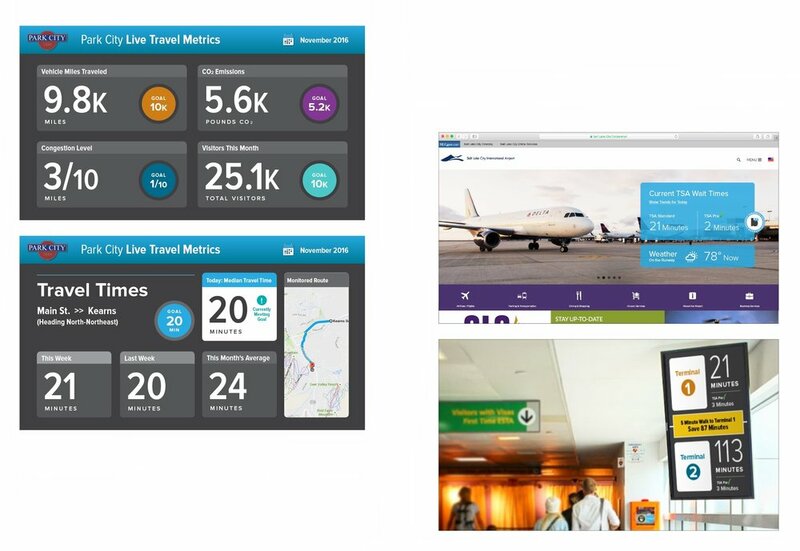 In addition to the screens accessed by Blyncsy clients, we worked together to develop some public-facing screens for display on large TVs in spaces like a City Hall or airport. These images were developed mostly for the purposes of pitching, but the functional aspect was approached as if it were guaranteed to go live. Clear, bold hierarchy puts function over aesthetics while keeping the brand intact and providing the user with a pleasant experience in a stressful environment. 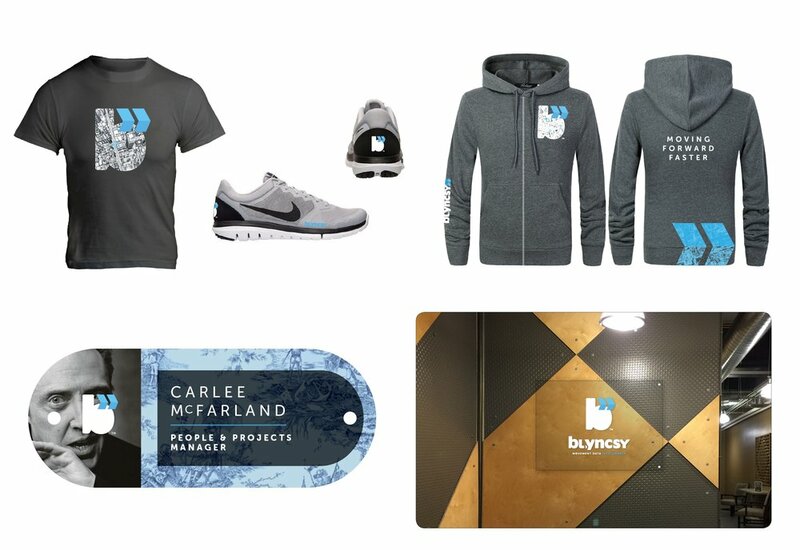 From the very beginning, it has been my pleasure to take excellent care of Blyncsy by not only being a single do-it-all communications resource, but a responsive collaborator and design partner. I'm eternally grateful for clients like these who challenge me, and with whom I share a great deal of personal and professional respect. I'd love to put you on that list, too.